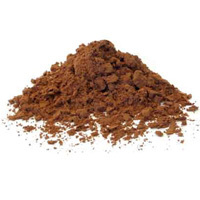 Food allergy to cocoa appears to be rare although occupational allergy in workers exposed to cocoa dust has been reported (Zuskin et al. 1998 ; Perfetti et al. 1997 ). However, self-reported allergy to cocoa appears to be common (Brugman et al. 1998 ). Because of this cocoa has been included in studies of the prevalence of food allergy (Young et al. 1994 ) and DBPCFC has been used. It has been suggested that intolerance to cocao involves biogenic amines. However, Jansen et al. (2003)  found no evidence for this. Moller et al. (1984)  in a study of of penicillin allergy in occupationally exposed individuals showed cocoa to produce non-allergic histamine release in basophil mediator release test. Becker et al. (1981)  extracted a species of 20 -40 kDa (centred on 26 kDa) which activates the factor XII-dependent pathways. However, the inflamatory activity may involve polyphenols binding to complement and does not necessarily involve IgE. Allergic and pseudo-allergic reactions caused by penicillins, cocoa and peppermint additives in penicillin factory workers examined by basophil histamine release. Jansen SC, van Dusseldorp M, Bottema KC, Dubois AE. Intolerance to dietary biogenic amines: a review. Young E, Stoneham MD, Petruckevitch A, Barton J, Rona R.
A population study of food intolerance. Brugman E, Meulmeester JF, Spee-van der Wekke A, Beuker RJ, Radder JJ, Verloove-Vanhorick SP. Prevalence of self-reported food hypersensitivity among school children in The Netherlands. Perfetti L, Lehrer SB, McCants M, Malo JL. Occupational asthma caused by cacao. Zuskin E, Kanceljak B, Schachter EN, Godnic-Cvar J, Mustajbegovic J, Budak A. Respiratory function and immunological status in cocoa and flour processing workers. Tobacco, cocoa, coffee, and ragweed: cross-reacting allergens that activate factor-XII-dependent pathways.